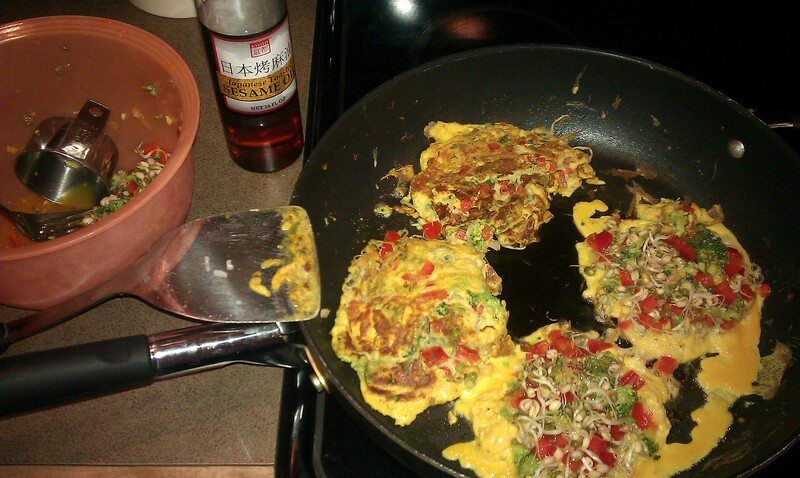 Egg Foo Young is a quick and easy vegetarian/pescetarian dinner. We sprout our own mung beans and that takes several days, but otherwise, this doesn’t take much planning. I whisk two eggs per person, and add vegetables until it looks like there is the same mount of veggies as eggs. You want one half of the veggies to be mung bean sprouts. Season with Thai fish sauce*, about 1 tsp per four eggs, and finely minced ginger and garlic to taste. Scoop mixture by a half-cup measuring cup into a hot pan coated with oil. I prefer a combination of olive oil and sesame oil. Sometimes a little egg will run, it is OK, just pull it back to the egg foo young “patty” with your spatula. Fry until golden on each side. This night we used a diced red bell pepper, bean sprouts, broccoli, onion, garlic and ginger. You can use any leftover meat, fresh or par-cooked vegetables. Serve with hot jasmine rice. *Fish Sauce is not vegetarian.